Bruce’s land in King Valley (Wangaratta, Victoria Australia) where he plans to create an EHS Refuge as soon as people come join him. April 28, 2016 Update: This sanctuary is on hold for now. You can contact Bruce directly at admin@radiationrefuge.com or visit his website: http://radiationrefuge.com/ for a worldwide list of EMF-safe accommodations and locations. September 28, 2014 Update: In the one week since I posted this story, Bruce has been flooded with emails. He is working his way through all emails, and he is responding to everyone by email or phone. He is also trying to defend his cottage from being bulldozed by the government, as described in the article below. So if you have not received a reply, please be patient. He does plan to reply to everyone. Bruce Evans is man on a mission. And he is looking for other people with Electromagnetic Hypersensitivity to join him in creating an EHS refuge in southeast Australia, on land outside of Wangaratta, Victoria in the King Valley. The land is available for occupancy right now for anyone who can come with a van, tent or caravan. Those who arrive first may be able to have one of the bedrooms in Bruce’s cottage. People who want to visit the land for a temporary “holiday” from wireless radiation are welcome. But Bruce is also looking for electrosensitive people who want to stay long-term, build their own cottages on his family’s land, participate in the farm and help create a community safe from electropollution. There is an urgency to Bruce’s mission. The land his cottage is on is government land. It has been used by his family for more than 150 years, and it adjoins a vast tract of land that his family owns outright. The government is now threatening to seize the small portion of government land and demolish Bruce’s cottage, despite an existing contract that would (in theory) prevent such action. The showdown with the government could happen next month, in early October 2014. 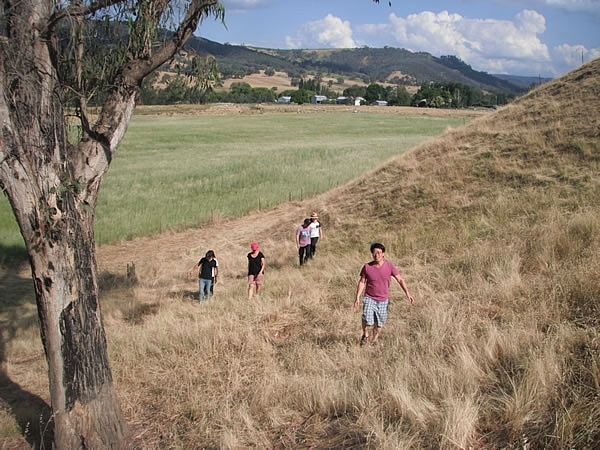 Bruce Evans, a 49-year-old web designer with EHS, wants people to come join him on his rural farm in southeast Australia to create an EHS Refuge. Bruce is 49 years old and works as a web designer. It is a profession he has been able to relocate to his rural cottage in King Valley, since the work is largely done online. He says other electrosensitive people with similar web-based businesses could do likewise on this property. 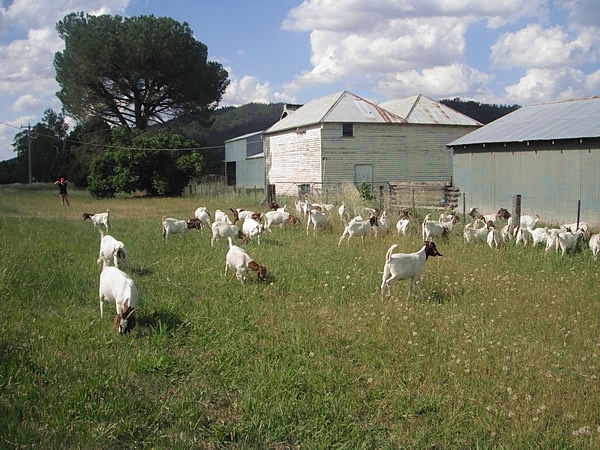 A herd of goats from the goat farm across the road is fond of grazing in Bruce’s yard. 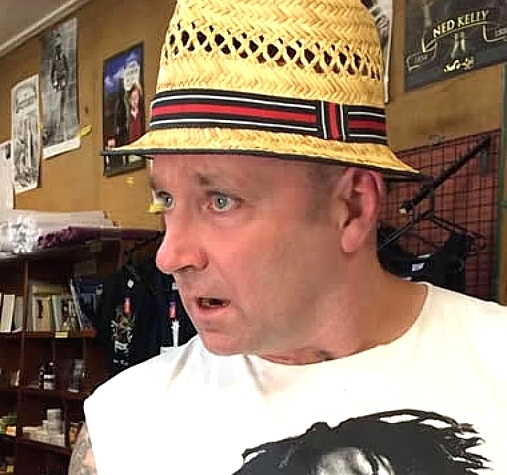 Bruce says he would be devastated if the government bulldozes the cottage that has become his own safe haven, and one that could shelter a few other EHS people as well. However, it won’t be the end of his sanctuary plans, since his family owns a much larger block of land two kilometres away. “We have vast tracts of land that are completely owned by us and cannot be taken away,” says Bruce “It is a beautiful countryside with plenty of trees and much scope for secluded living. My father is willing to let people come here and build their own cottages, grow their own food and put in a little bit of farm work to earn their keep. There is some work in the surrounding districts with various farms and vineyards. There may be some work for people who have website or IT experience,” he adds. In addition to the family farm on the property, Bruce is interested in developing communal facilities for the EHS refuge such as a communal kitchen, internet hub and gym suitable for yoga, martial arts and more. People with internet-based businesses could run their business from the property. Healing businesses such as meditation, yoga or massage would also be quite feasible and welcome. King Valley is located midway between Moyhu and Whitfield. 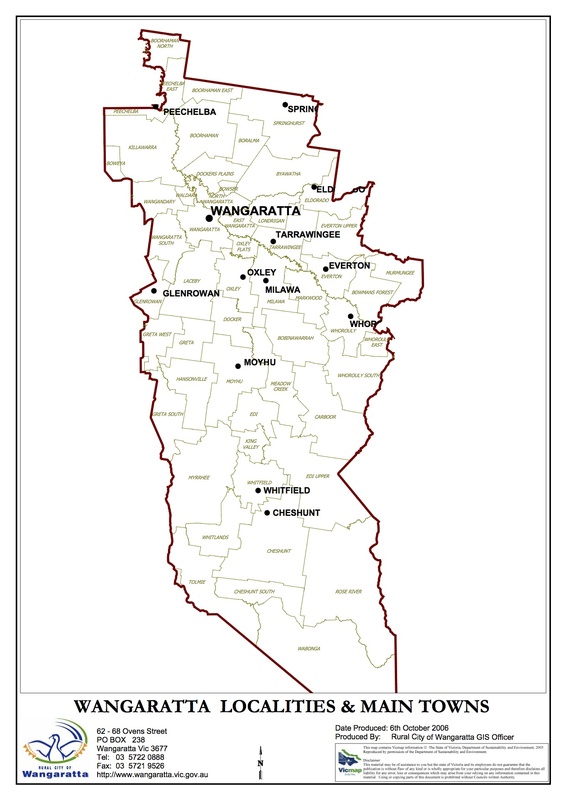 See map below, or download map here: Map of Wangaratta Area. See the land on Google Maps here. This entry was posted in EHS, EHS Stories and tagged Australia, Bruce Evans, EHS Refuge, King Valley, Sanctuary, Wangaratta, Where can we live?, white zones on September 21, 2014 by Kim Goldberg. Hi Ruth. You are welcome to ask him yourself. His email address is near the top of the article, in bold. No need to have me do it for you. 🙂 I believe his own dwelling (the cottage) in on the grid. But people who want to come to the property and live off grid would have a vast expanse of property to choose from – so no one needs to be near power lines or an inverter if they can’t tolerate it. An inverter is not essential, btw, for off-grid power. If all of your appliances and lights that you plan to operate are DC, then you do not need an inverter to convert to AC. And some people do indeed power their abodes with solar power and NO inverter. It is also possible to position the inverter a far distance away (for those using an inverter system), so that its effects in terms of EHS are negligible. This is sooooo very exciting. I am in the US so can not come visit. We need someone like you, Bruce Evans, here in the US, and in all countries. If there were a sanctuary anywhere in this country- not Greenbank- I would be there. I wish you total success with this!! what about long term living there……immigration laws, etc…? Do i need a visa to come? Can people work around immigration laws? Like staying only for 6 months, then moving out for a short while and coming back for 6 months? what ways to live there if you are past 45 yrs old, the usual cut off age for immigration? You are a true pioneer. I applaud your courage,!